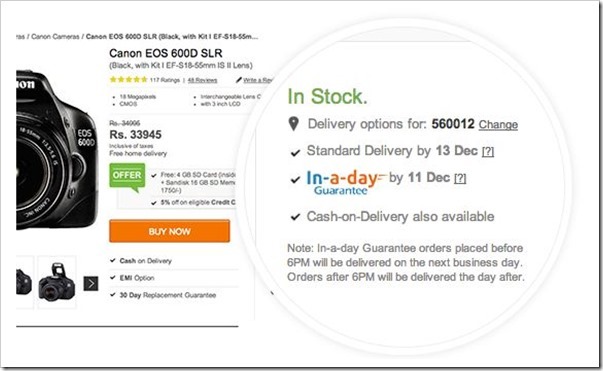 It’s been only 5 days since Amazon India launched its guaranteed 1-day, 2-day delivery option, and Flipkart has immediately come out with “In-A-Day” Guaranteed delivery option. In-a-day Guarantee is our Flipkart’s new delivery service, where orders placed before 6PM will be delivered the next business day. Orders placed after 6PM will be delivered the day after. This service is available only for orders placed with their own partner seller WS Retail. As of now, this service is available in 7 Indian cities of Bangalore, Chennai, Delhi, Hyderabad, Mumbai, Noida and Pune. The “In-A-Day” guarantee comes at a price of Rs. 90 per item (It is not per order, but per item). Incase Flipkart is not able to deliver the product within the promised time, the amount charged for shipping is refunded back to customer’s Flipkart Wallet. For Cash-on-Delivery orders, the delivery charge will be collected as part of the order, but will be automatically refunded to customer’s Wallet within 24 hours. Flipkart is India’s (and mine as well) favorite e-commerce site, there is no doubt about that, but it is frustrating to see Flipkart being reactive rather than being proactive. This guaranteed service would have been a big deal if Flipkart had announced it before Amazon did. But now it clearly looks that they have launched it to compete with Amazon. There is nothing wrong with it, but in user’s mind, it will always be that they have aped Amazon. And this is not the first time – Even when Amazon launched earlier in the year, Flipkart increased their affiliate commissions to match them. Whereas, for many years since launch, they had never bothered to increase the commissions. I looking forward to see the day when Flipkart launches something so good, that Amazon will need to replicate! In next 3-4 years Amazon is going to be the biggest competitor for flipkart.com so they are just trying to make an impact on customers mind with this. What…. Aren’t they already…. Infact, if my guess is right, Amazon is having more traffic than FLipkart at this point of time. Flipkart may have more orders, but Amazon is attracting more eyeballs, and I am sure with categories they are launching, they should move ahead within no time..
Why only refund? Thats too easy. They can go on charging Rs 90 and return it a week later without bothering to be accountable. I would like to see if they are confident enough to provide a credit for not being able to deliver on time.